The famous dome of AntarcticaÕs Amundsen-Scott South Pole Station shimmers in the summer sunlight on Jan. 20, 1996. 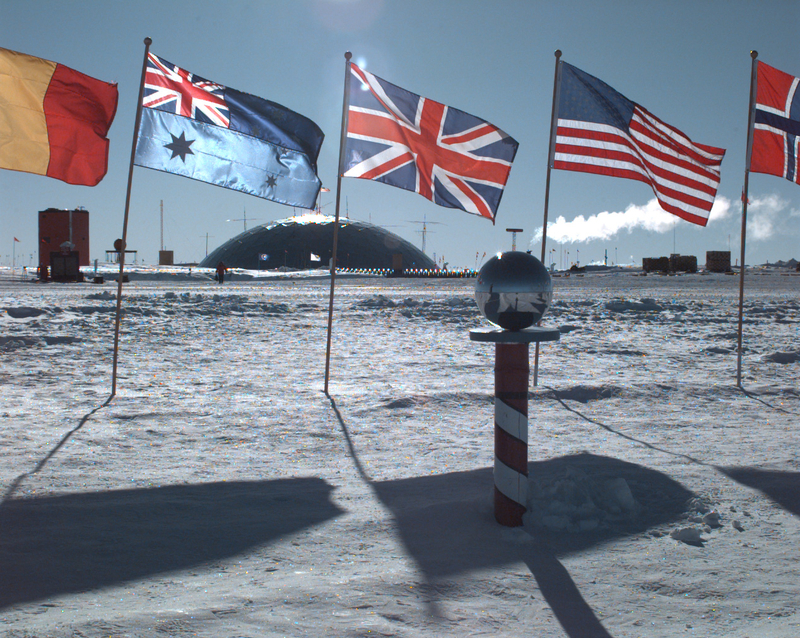 The flags of 13 nations which have officially adopted the Antarctic Treaty fly at the South Pole and represent the unprecedented international cooperation among the world community on the continent. This year 27 carefully selected workers and scientists will Òwinter overÓ by spending six months in total darkness in and around the station, sometimes braving temperatures which can fall to minus 100 degrees Fahrenheit, not including wind chill. Between October and February, the remote site at Òthe ends of the EarthÓ is reached by LC-130 Hercules ski-equipped aircraft flown by specially trained U.S. Navy and Air National Guard flight crews. DoD photo by Petty Officer 2nd Class John K. Sokolowski, U.S. Navy.